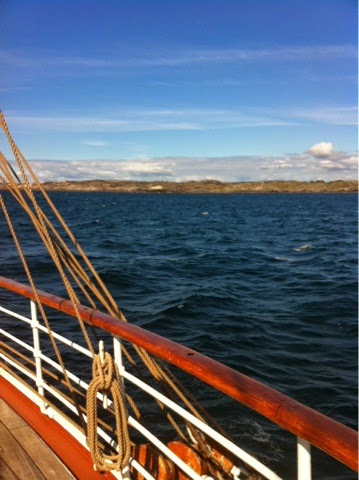 I'm back on Sorlandet for a summer of European tall ships races in the North Atlantic/North Sea. I rejoined the ship in Kristiansand, Norway, where I left in May. A lot of changes since I was on last. Class Afloat is gone and Sorlandet is running a summer of sail training programs for all ages. There are a lot more Scandinavians on board and I am now the cook! The galley department is a bit differently organised, there's the Chief Steward, Cook, Cook's Mate and Mess Girl. So far we don't get a daily galley team but this hasn't been a problem with four regular crew dedicated to galley. One of the nicest things about this summer is that my friend Nadia, who I met last summer on board is here as Cook's Mate! We spend our days together, both when we are working and when we are off. One day we may get tired of each other's company but not yet. A lot of the volunteers on board I know from last summer or from Class Afloat and with some returning maritime crew there are plenty of familiar faces.